525pgs. Sri V.T. 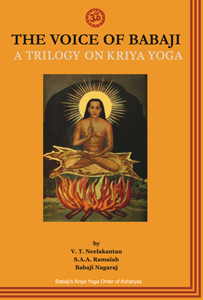 Neelakantan recorded verbatim a series of talks given by Satguru Kriya Babaji in 1953. These are a fountain of delight and inspiration, illuminating the Kriya Yoga path towards God realization, unity in diversity and universal love. They also reveal the magnetic personality of Babaji and how he supports us all, with much humour and wisdom. They were originally printed in three volumes: "The Voice of Babaji and Mysticism Unlocked," "Babaji's Masterkey to All Ills, (Kriya)" and "Babaji's Death of Death (Kriya)." Includes the fascinating accounts of the meetings with Babaji in Madras and in the Himalayas by authors V.T. Neelakantan and Yogi S.A.A. Ramaiah. Out of print for nearly 50 years, they are profound and important statements from one of the world's greatest living spiritual masters.